Claire Pollard gives two players advice. Her freshman Clarissa Hand won Big Ten Tennis Athlete of the Week. Freshman Clarissa Hand, ranked No. 100 in the nation, earned the title of Big Ten Tennis Athlete of the Week following her three-match sweep through the field at the Miami Spring Invite last weekend, becoming the first Wildcats’ rookie since 2015 to gain that recognition. Last year, Hand was ranked a five-star recruit by TennisRecruiting.net, and she’s replacing Erin Larner and Maddie Lipp, who graduated after leading NU to last year’s Big Ten regular season championship. Against the field in Miami, Hand upset No. 7 Estela Perez-Somarriba from Miami 6-3, 6-4 and won two doubles matches as well, leading the Cats to the best finish out of the four-team field. In doubles play, Hand and Lee Orr handled a Miami doubles team ranked No. 51 in the NCAA, as well as a duo from Vanderbilt. 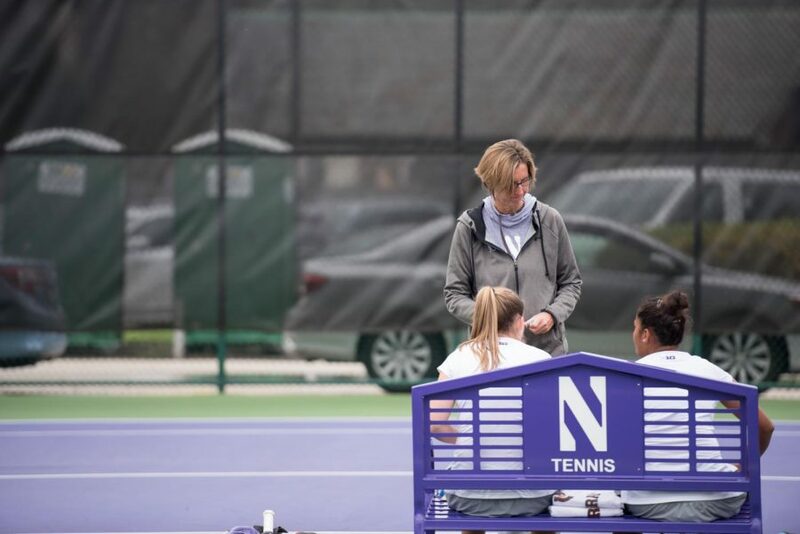 Winning 9 of its 12 matches at the event, NU impressed in its first matches of 2019. While inclement weather impacted the event’s schedule throughout and led to the third day being cancelled, coach Claire Pollard said the Cats were able to show they’ll be a difficult team to match up against over the season.